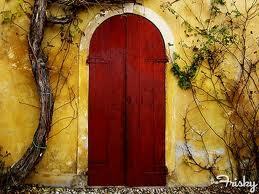 A common misconception in feng shui is that all front doors should be red. While fire energy does help attract chi (life force energy) toward a building, it is best to discover whether it is suitable in that location of your building before committing. There is no generic good color for a front door, bedroom, office or kitchen since every building is different and carries its own unique energy. Red is a fire color – an attractor that warms, illuminates and draws the eye to an otherwise quiet or monotonous landscape or building structure. However, fire in the wrong proportion or location can be destructive, leading to arguments, health problems and obstacles for residents or employees. In authentic feng shui, if the facing compass direction and building construction year favor fire in that sector of your building then go ahead and paint the front door a vibrant shade of red. If you’re not sure about which of the five elements are best suited to your front door, choose a natural wood or neutral color or check with a feng shui professional who can help.